I have had the privilege of teaching Ikebana Japanese flower arrangement to over 150 students from every corner of the world. My Ikebana classes are really international and my students are men and women of all ages, from 10 to over 80 years old, and from all walks of life. I am taking a break from teaching regular, weekly classes. I am delighted to say that some of my most senior students are now running classes in and around London, Malaysia and Spain! If you’d like more details, please contact me. However, I am now planning one or two weekend intensive courses in Ruislip during spring 2019. These very successful and fabulously enjoyable weekend courses will be for students of all levels, from complete beginner to advanced. They’re always marvellously international with people from not only the London area, but also from far further afield. To register your interest, please contact me. For more information about the courses visit weekend intensive courses. If you’d like to see some of my students’ arrangements, take a look at my students’ picture gallery. 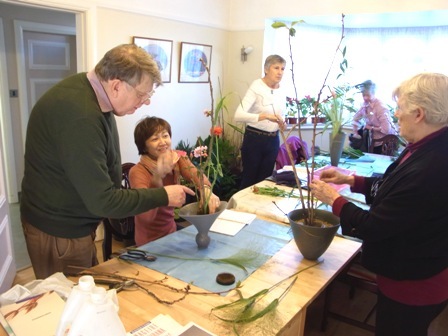 Whether you are looking for a relaxing, creative hobby, to become a teacher of Ikenobo Ikebana, or something in between, I can offer the right level of tuition for you. For classes availability, to book your course or for more information, contact Junko through our contact form.